Tabbouleh, at first glance, seems to be a simple salad, but when eaten with other Lebanese foods such as falafel, you begin to realize the playfulness of its texture, fresh aroma and slight sourness. 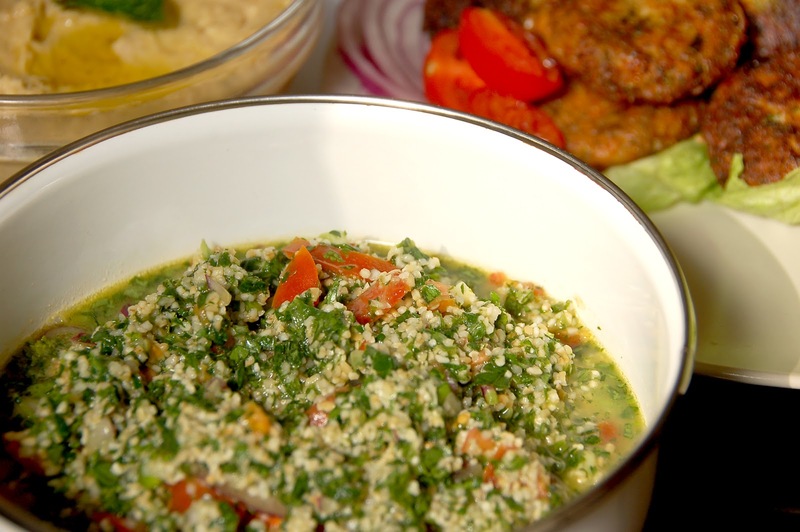 It's perfect to cool down the palate after a big bite of a falafel sandwich and refreshes the temptation for yet another one. 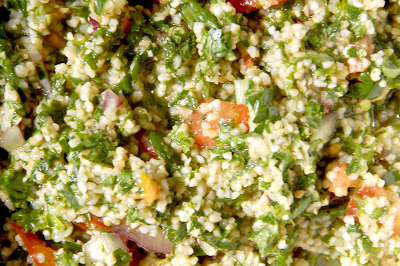 Tabbouleh is a typical middle-eastern salad: fresh, simple, quick to make and, of course, sour! The art of making a good tabbouleh, though, seems to lie mostly in the preparation of the bulgar. This cracked wheat is available at any Indian grocery store (ask for "dalia"), and when placed in water, soaks it all up! This softens the wheat, but if the excess water is not removed, the salad comes out all soggy. Squeezing too much water out, on the other hand, makes it incredibly sticky. After a few trials, I realized that the best way is to use hot water for a shorter period of soaking time, and giving it only a little bit of a squeeze. Still, after adding the copious loads of lemon juice, the salad still came out a little watery. This was a compromise we had to make to make sure the grain stayed separate and retained its texture. Of course, if a more dry salad is desired, the water can always be removed. Overall, this was a very refreshing salad, but perhaps could have been better by replacing lemon juice with that of lime; the lemon was a little bitter that's all. 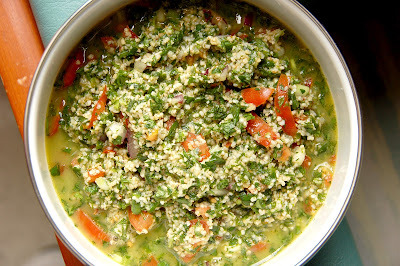 Add 1/2 cup hot water to the bulgar, cover with a cloth, and let it soak for about 30 minutes. Drain and place soaked wheat onto a cloth. Squeeze slightly to drain some of the excess water. Combine wheat with tomatoes, onions and herbs. Mix well. Add lemon juice, olive oil, salt and pepper to taste. Mix well again and serve.